7049 Bay Road Mobile, AL. 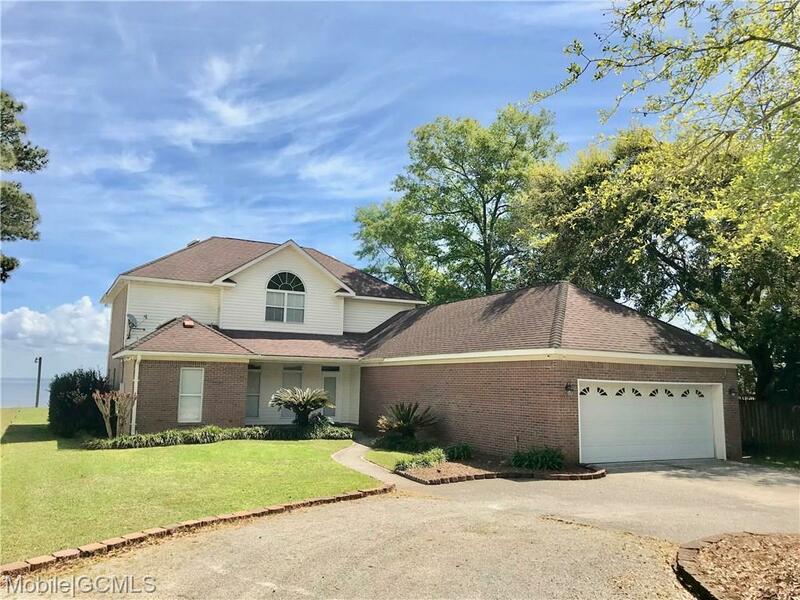 | MLS# 625151 | Assist-2-Sell Buyers and Sellers Realty - Homes for sale in Mobile County and Baldwin County. We work with buyers and sellers. ***SELLER IS WILLING TO ENTERTAIN OFFERS BETWEEN $429, 000 & $479, 000. *** LIST PRICE =COMBINED UPPER AND LOWER VALUE RANGES. A rare find on prime waterfront. Welcome to beautiful Mobile Bay! With a great view of the bay throughout this Coastal Cottage style home, the stress levels will dissipate. Walk to the dock at the end of the pier to sit and watch the pelicans fly by, the boats float by, and the greatest artist paint the sky. Sunrises and sunsets are phenomenal, per photos. Those you can enjoy from the covered porches off the bedrooms. This is truly a beautiful property that one must see to appreciate. Interior colors are soft and soothing. The kitchen (with a view of Mobile Bay) has lots of cabinet space, granite counter tops, and stainless appliances. This, combined with the dining area that flows into the living area, creates that desired open floor plan. The HVAC systems are new in 2018, all bathrooms have been updated, and new flooring featuring high grade vinyl plank flooring, colored whitewash gray, are recent upgrades to this home. Truly adding to the coastal feel are the colors and fixtures chosen for the upgrades. The living area boasts soaring ceilings and a built- in entertainment center with bookshelves. Walk in closets, nice sized bedrooms and the general flow of this home make it a truly inviting, entertaining and family home. Owner has installed a whole house water filtration system as well. Outdoor living extends from the interior of the home by means of a screened porch, an open deck, as well as a pier that takes you to the covered boat dock with it's own swing, making this a reflective spot for anyone to enjoy. And for those who love crabbing there is a small crab deck attached. The bulkhead is in excellent condition and the owner chose to reinforce this bulkhead with rip-rap. This home has an elevation that negates flood insurance, but for those who still desire flood coverage, the very affordable price is $450.00 per year. Homeowners insurance is affordable as well. Please make your appointment soon to see this excellent property. Buyers to verify square footage, lot size, and any other matters that are important to them. Directions: Dauphin Island Parkway South To Left On Island Road, To Right On Bay Road. Home Is On The Left.